Hey everyone Deanna here with another fun and inspiring project for you. To make my card, I started with a 4 1/4" X 5 1/2" white card base that I rounded the corners on. Next I took a piece of watercolor card stock and using Squeezed Lemonade, and Tumbled Glass distress Ink, I created a background for my sentiment. After stamping the sentiment I took one of the Open Studio Memory Box Stitched Circle Dies and cut the sentiment out. I love the Open Studio Stitched Dies, you get a wide variety of sizes and they are stored on a magnetic sheet. Be sure to check them out in the store. Next I die cut my flowers out using the Poppystamp Flower Stack Die. For my leaves, I again took some watercolor card stock and used the Tumbled Glass and Squeezed Lemonade and mixed them together to get my green. I cut the leaves out using the Impression Obsession Leafy Branch Die. After I cut the branches out, I cut them apart to fit my card. 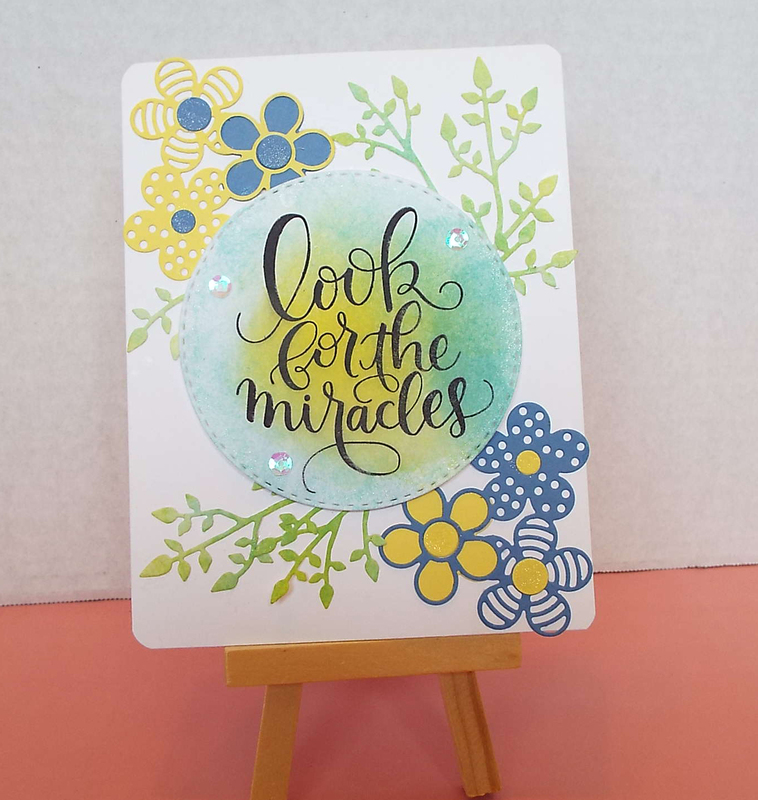 To finish the card I added some sequins to the circle and some Wink of Stella to the flower centers. A really pretty card, I love the flower dies and the inked background for the sentiment is gorgeous. Beautiful sentiment, love the background! Pretty, pretty flowers, I love how you have layered them too! Those flowers are so fun, love the different styles and great uplifting sentiment to go with them! Deanna, this is such a darling card! The inked background is perfectly dreamy for this sweet sentiment! I think the way you arranged everything on this card is perfect and eye catching. Thanks for sharing it with us. lovely layout and great use of the flowers.